“Darkseid War,” the eagerly awaited new Justice League storyline that will find Earth caught in the crossfire as the universe’s two most powerful villains clash, kicks off this week in JUSTICE LEAGUE #41. Earlier this year, we spoke with writer Geoff Johns and artist Jason Fabok about this massive new story and what it means for the Justice League going forward. 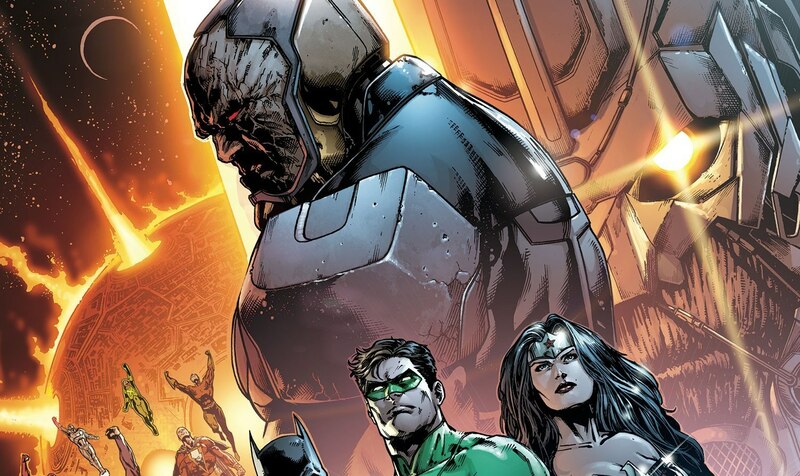 So what can you tell us about “Darkseid War”? Jason: Some classics are going to come back. Geoff: Some classics will be reinterpreted, but it’s kind of like a mix of everything we’ve set up since issue one, and paying that all off and then introducing a lot of new elements and new characters to send us into the future. We’ve never seen these two villains go up against each other before, and the story kind of came from asking, what could be the hardest thing for the League to deal with? What if they’re not actually the target? What if they have to stop a war? I think the first Anti-Monitor tease that I saw was at the very end of “Forever Evil.” Has the storyline been planned from the start? Geoff: Yeah, when I first started Justice League #1, I knew that for at least a year I wanted to have the team just be the big seven, and then, ultimately, who can I bring on this team that is going to shake it up at the end of year two? What is the biggest character in the DC Universe that everyone in the world knows, someone that even my mom knows, but that would be incredibly interesting on the team? And that was Lex Luthor. You also mentioned introducing a new team member. The lineup we currently have in Justice League, is that going to be more or less the lineup in “Darkseid War,” or is there about to be a big shake up between now and then? Geoff: I think part of the fun of team books is always who is on the team and why they are on the team and why they come or go. Our team is going to continue to grow. I don’t think we are going to necessarily lose a lot of members because we like our core seven, but it’s always fun to throw somebody like Lex Luthor on the team. Mister Miracle is the character that we’re going to reinvent and reintroduce, in a hopefully very big way during this storyline. He’s just been so much fun. Jason, I’m a huge fan of your work on Detective, and Batman Eternal has been just awesome, but I’m curious, going back a bit, what were your feelings when you got the Justice League gig? Were you looking forward to telling bigger scale stories? Geoff: It’s such a good story about how we first talked about it. Jason: It was a night I’ll never forget (laughs). Geoff: You know what’s funny? It’s a night I’ll never forget. I want to just preface this because it’s a compliment to Jay. I work with the same artists a lot because when I find a collaborator, when we really enjoy working together and produce work that we’re proud of, I just want to continue to do that because it’s so rare—it’s actually really rare for a writer and an artist be so in sync on stuff, and Jay is that guy. I haven’t really worked with somebody new like Jay in so long, but he’s brought an energy that’s super exciting. Getting him is a real coup. I just don’t know anybody else who could do Justice League the way he’s doing it. Geoff: I was on the set of Flash in Vancouver, on break. Geoff: When we got on “Darkseid War,” in particular, I needed one of the New Gods characters as a focal point because of the way this story unfolds and I was thinking about which one to use. I’d always thought Mister Miracle was an interesting character—the universe’s greatest escape artist—but I hadn’t written him. I had never really written any New Gods characters so it was brand new to me. But I loved it because I love taking characters that are maybe off the beaten path and figuring out, okay, how can I shine them up? What’s he really about? Why does he do what he does? Where is going to go next? How do I expand what he can do in his role in the DC Universe? I think we’ve actually hit on something quickly that I’m really excited about. I think Scott Free is such a great character and he brings a different kind of energy to the book, just like Luthor has, and seeing him interact with certain League members will be lot of fun. Jason’s going draw the hell out of it. The DC Universe is becoming more and more visible overall, and I think a big part of it is because of the TV shows and the upcoming films. How do you keep a title like Justice League—that’s been going for a long time—how do you keep it fresh and approachable so that somebody that sees these characters on screen can just pick up an issue and start reading? Geoff: My favorite things to do are ones you can’t believe haven’t already been done. I kind of can’t believe that Luthor has never been on the Justice League before. I kind of can’t believe that Darkseid’s never fought the Anti-Monitor before. With one of our villains, I actually can’t believe that no one has ever introduced a villain like that before because it feels very iconic. It feels like it’s always been there. But I think the best ideas are the ones that feel super organic – they don’t go against the grain of the character or the concept. They feel like they’re a part of it organically and integrated into it in a very natural way. What I’m hoping is that “Darkseid War” does that on a big scale with everything we’re trying to do. I mean, the first issue is 40 pages long. We’re making this an event within our book and doing it as big as anything I’ve ever written, and really trying to do character driven action and intrigue with the world’s greatest super heroes, and some that you’ve probably not had a lot of experience with. I love Trojan horsing in characters like Mister Miracle or Shazam, like in our TV shows. On The Flash, we’re doing that with Firestorm. We have the Suicide Squad movie coming up too, and that is going to feature characters that a lot of people don’t know, but we know. I do harken some of it back to when John Ostrander first did Suicide Squad. One of the things that made me realize that any character has value is that he took characters like Deadshot, Captain Boomerang, Enchantress, Count Vertigo and Rick Flagg, and he explored these characters in new ways. I don’t know that anyone thought they could ever be as complex and intriguing as they became. That’s our goal. Maybe you’ve seen Mister Miracle but can we get in a little bit deeper? Even big characters like Lex Luthor—can we get in a little bit deeper? Can we explore them in a new way that still is true to the core of their creation? JUSTICE LEAGUE #41 by Geoff Johns and Jason Fabok will be available in print and as a digital download this Wednesday. Put Yourself in DC You!